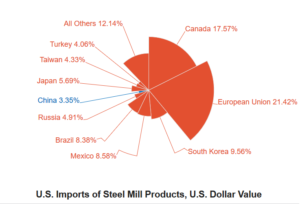 The US imports directly about 3.3% in value and 2% in quantity of steel from China (the two figures are not the same because prices vary by countries of origin). China produces around 800 million tons of steel a year. It exports to America, 740,000 tons, or 0.1% of steel production in China is exported to the United States. 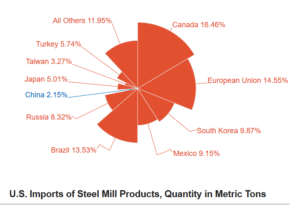 Combining the third and fourth points above, the value of steel imports from China to the United States is about $ 1 billion. (3.3% of 30 billion). By applying 25% of duties on this value, a duty value of 250 million dollars is obtained. Even assuming that because of the duties of 250 million dollars, exports halved (unlikely), the economic damage to China would be little more than 100 million dollars, the price of a good football player (which China needs desperately). Taking into account the statements of the Ministry of Commerce, China will take measures appropriate to the damage suffered, that is minimum. 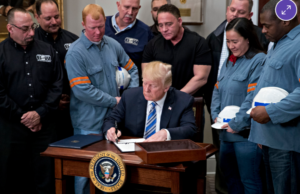 As it is often the case, the commercial rhetoric about liberalism against protectionism that well captures the popular imagination, when one looks at the numbers is far less serious than perceived. A warning also for our internal disputes within the EU between those in favour of greater trade liberalism and those who, instead, tend to more protectionist measures. It is always necessary to look at the numbers before arriving at hasty conclusions about the real damages or advantages of one or the other choice. The low economic impact of this news also goes to confirm, partially, my view that selective protectionism, that is aimed only at a certain number of products but not at all, and directed at a number of countries but not at all, it does not brings all those damages that some want to make us believe. Official Press Release from the Chinese Ministry of Commerce, in Chinese and English, using Google-Translate.